• Harmony and singing techniques and a group sing-along! You’ll be able to develop Ukulele Band skills, using pieces arranged for different ability levels; gain performance tips – get thinking about how you want to present your music improve stage craft and presence – and develop confidence and song writing skills, unlocking some creative potential! 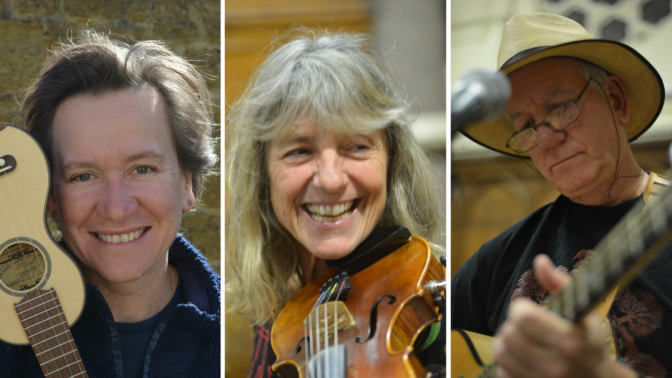 The tutors are two members of the Oxford band Moonrakers (Jon and Liz) – www.moonrakers.net – joined by guest tutor, the wonderful Samantha Muir. Jon Bennett is a multi-instrumentalist specialising in fretted instruments of all kinds. He has been a tutor at Scotland’s Common Ground Festival, Towersey Folk Festival and the Wallingford Bunkfest, and is an established guitar, bouzouki and ukulele teacher based in Oxford. He runs workshops and individual classes and has teaching aids at www.ukuleleoxford.com. Samantha Muir: Enjoy progressive and fun tuition from a full time professional performer and teacher. Samantha plays everything from Bach to sea shanties and will be happy to get you started on the ‘campanela’ style of playing ukulele. Don’t be intimidated – it’s easier than you think! Samantha will help you towards playing some very well known tunes from her extensive repertoire, plus lots of tips and tricks on how to improve your playing in general. Liz van Santen is a skilled teacher and fiddle player. She’ll lead the singing workshops, but will also be available to add instrumental arrangement ideas to the ukulele classes too (if you want to bring instruments other than ukulele, please do!). You can go back and forth between the singing and the ukulele workshop. On the Sunday we’ll all come together for an informal concert.